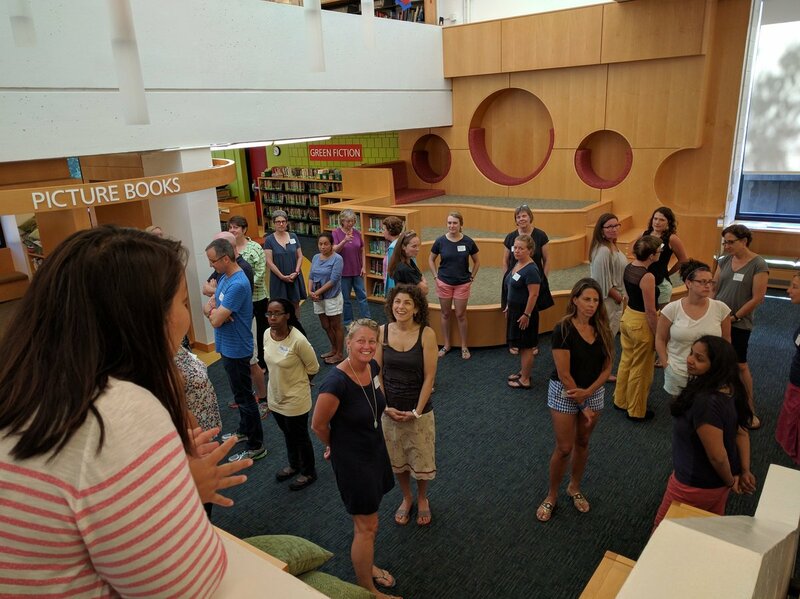 This summer, the library buzzed as many Park faculty and staff gathered for four days of collaborative thinking at the Park School conference, E3: Engaging in Educational Excellence. Each morning included discussion and activities, focusing on a particular aspect within the lives of schools: Diversity, Equity & Inclusion (DEI), Curriculum & Instructional Design, and Educational Technology. In the afternoons, participants chose from a selection of nine workshops that explored the three tenets in depth. Liza Talusan led the group in DEI thinking: Who You Are Is As Important As What You Do: Identity Conscious Approaches to Work. She asked questions, such as “what does it mean to bring your whole self to work? How does identity inform our interactions with students and families? What is identity consciousness?, Participants were invited to engage in activities to raise identity consciousness and build awareness of identities and experience and examine the impact of identity consciousness in daily work (based on our roles). Pamela Penna guided a conversation entitled: Same Charge, Same Challenges: Teaching for Understanding. In placing understanding at the center of teaching, we ask ourselves: How do I know if students understand? What shifts can I make when planning units and learning experiences to give students what they need in order to understand? Finally, Jorge Vega encouraged teachers help students be themselves online. Participants explored how integrating technology into curriculum can often feel daunting, while considered how what we’ve learned in the past can still serve our classrooms in the future.